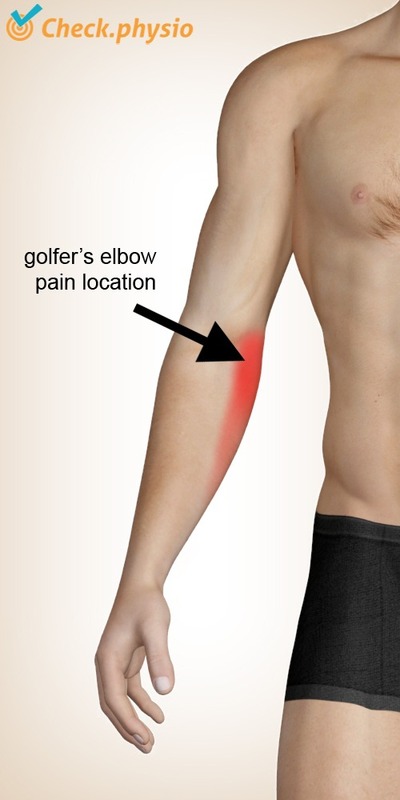 The pain of golfer's elbow is located on the inside of the elbow. The pain can radiate down the inside of the arm towards the hand. The symptoms often occur with repetitive DIY-tasks or when performing household tasks. The term "golfer's elbow" is misleading, because only a small number of people with golfer's elbow actually play golf. The forearm flexors are the muscles that allow the wrist and the fingers to flex (bend). They join up at the inside of the elbow, where they attach to the bone via tendons. In the case of golfer's elbow, the muscle tension of the forearm flexors is increased. This increased muscle tension causes the tendon attachments of these muscles on the inside of the elbow to become irritated, resulting in pain symptoms. The symptoms often develop gradually. The golfer's elbow can develop with activities that require daily frequent and prolonged tightening of the forearm flexors. For example, when working with tools that must be held in hand all day and when playing golf. Climbers are also at increased risk. Stabbing or nagging pain on the inside of the elbow, at the level of the medial epicondyle (this is the hard lump on the inside of the elbow). The pain can occur when forcefully making a fist (with extended elbows). The pain is provoked by lifting an object with an underhand grip. Pressure on the inside of the elbow can provoke the symptoms. Sometimes the pain radiates down the inside of the arm towards the hand. The symptoms can also occur at rest. The symptoms fluctuate throughout the affliction, ranging from phases with a lot of symptoms to phases with few symptoms. There has not been much thorough research into the treatment of golfer's elbow. Current insights suggest that eccentric muscle strengthening and stretching exercises of the forearm flexors can result in recovery. The physiotherapist can assist you in this.